According to the Daily News, Miami Heat star Dwyane Wade's nephew was shot and wounded on Thursday on the South Side of Chicago during a six-hour shooting spree. The incidents injured 12 people, including Wade's family member, and killed two. A spokesperson for Wade confirmed that his nephew was one of those injured in a Thursday shooting at a convenience store. The spokesperson declined to confirm the nephew's name or condition. Wade, a Chicago native, was playing in a game at Toronto on Friday night. Wade's nephew was one of six males shot at a store on Chicago's South Side at about 6 p.m. Thursday by hooded men who police said fled the scene in an SUV. One man was dead at the scene and four others — ranging in age from 16 to 24 — were hospitalized in critical condition. The Cook County medical examiner's office identified the slain man as Shawndell Harris, 22. 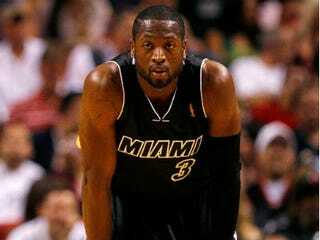 "I don't have all of the details at this time," Wade said in a written statement released early Friday evening. "My thoughts and prayers are with all involved, including my nephew and sister. Having grown up in the inner-city, I am aware of the difficult realities that exist on the streets. One of the goals of my foundation, the Wade's World Foundation, is to continue to spread the message that the violence needs to stop." Statistics show that Chicago's fatalities have risen from 55 in 2011 by this time to 101 in 2012. Whatever happened to "increase the peace"?